I’ve found myself looking up from under flowering trees this spring while out on hikes and photo expeditions. 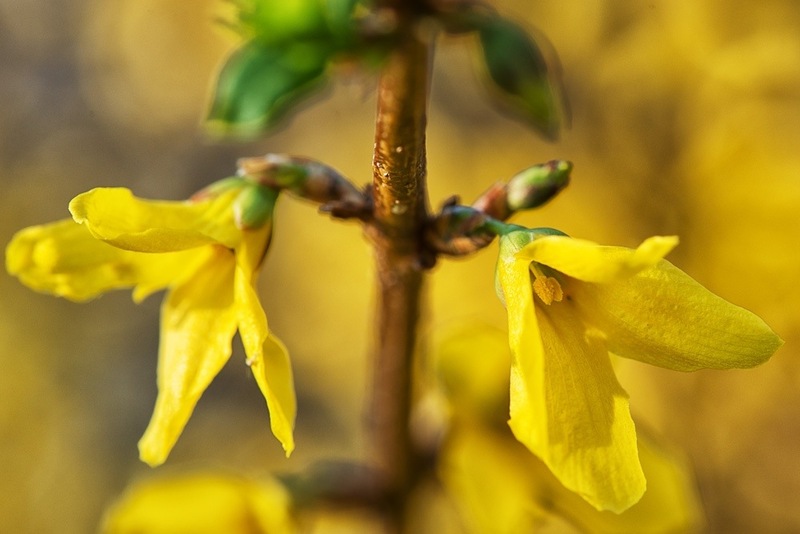 I spent some quality time with this forsythia last week and experimented with different angles while working with my macro lens. It seems more natural for me to shoot down into flowers, but sometimes looking up offers an altogether different perspective that makes for a fun image. forsythia is that what these are? I see them every, always wondered! Yes, I only recently figured out their name as well. I grew up calling them sun shrubs since as a child they always reminded me of a bright sun shining! It’s a sure sign spring is on the way when the forsythia is blooming. It’s always a welcome sight for me! Cool photo!!! Thanks so much, David! Yes, I love the yellow flowers that signal spring is here. I’m hopeful that soon I can pack away the polar fleece! I love this photo. I’d imagine it was hard to get a shot that was worthy of the cut.